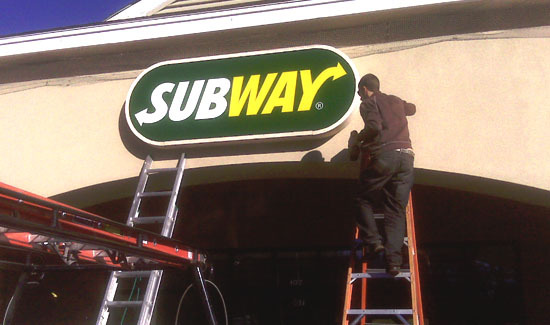 Dollar Signs and Graphics repairs, services and maintains signs made by us or manufactured by other companies. Our well-qualified sign repair and maintenance technicians use the same attention to detail we use in fabricating our signs, in servicing signs. We have all the tool need to get to and fix your sign. Our experienced journeyman electricians and signage technicians are concerned with helping you keep your signs bright for years to come. Our team will keep you informed of when your sign will be serviced and will follow up to make sure we met your needs. If you have a problem with your sign, you can depend on our expert repairs. We are also available to help you avoid problems with your sign with preventative care. We will beat any reasonable, written estimate by 5%.